Meet Domus Italian leather sectional sofa manufactured by Nicoletti available in white, grey or black leather colors. 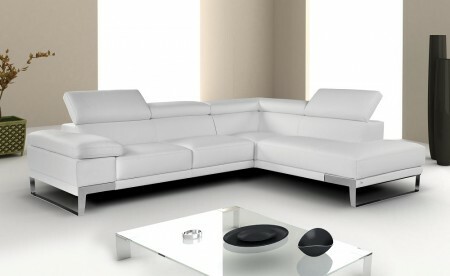 This piece of furniture will serve you for years to come and bring more style, comfort and luxury to your living room. It’s wrapped in full Italian leather, offers plenty of space with comfortable seating and consists of two pieces sofa and chase. At the top of the sectional you will find adjustable headrests that change the design and comfort level of this sectional. Attractive stainless steel feet complete its unique modern style. The wise selection comes from the brand that not only promises the quality and durability but also makes unique luxurious items Nicoletti.